It’s quite rare that my beauty regime is loyal to one brand – I’ll often be trying out a serum from a luxury brand followed by a high-street night cream, or an anti-aging cleanser followed by a newly launched oil absorbing day cream. Right now however I am treating my skin to an entire range – yes, from cleanser, to serum, to moisturiser, oil, and even night cream and eye serum all from one brand – Darphin. 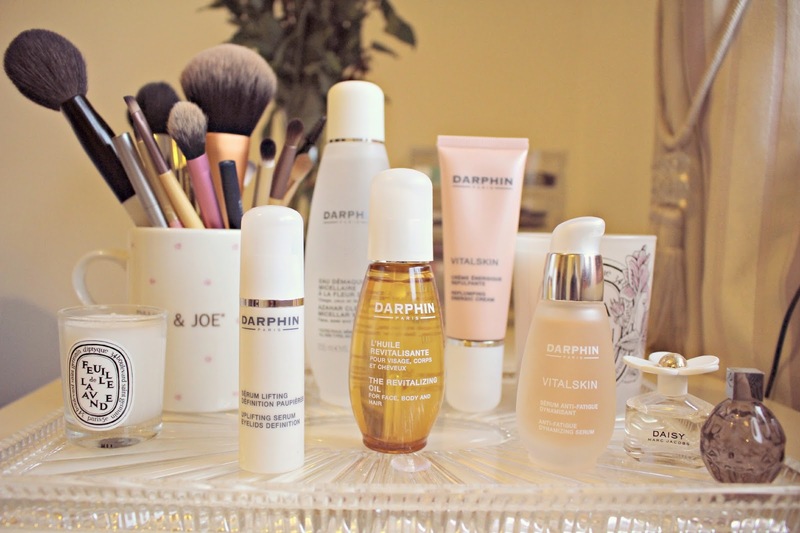 Darphin is a skincare brand of Parisian origins and they pride themselves on the finest botanical ingredients, innovation and expertise. 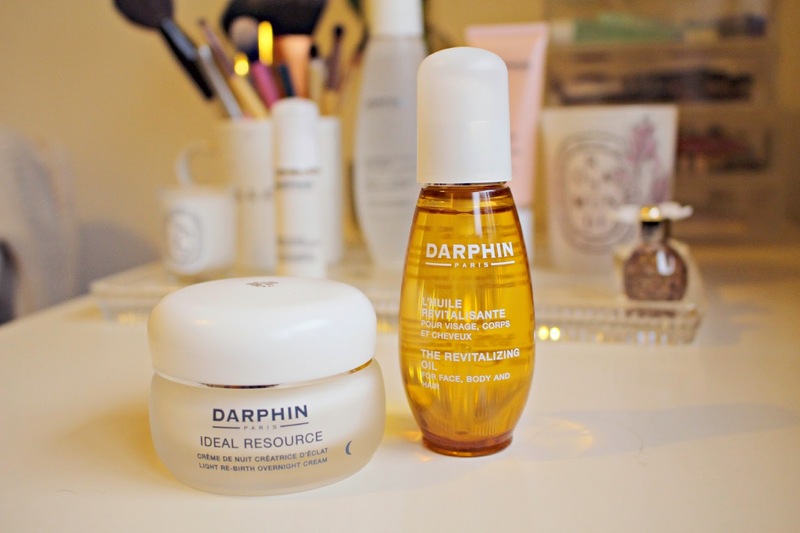 For me, Darphin products are ones which I can rely on when my skin needs an injection of nourishment – and I want to give my complexion a boost. A boost is exactly what my skin needs right now – with the change in the weather plus a bit of a hectic week or so at work and at home, my skin is looking dull. I’ve got more blemishes that I ever remember having before in my life (yes, really!) and let’s just say I won’t need any fancy dress makeup for my zombie outfit on Saturday night! Perfect timing then to step up my skincare routine with Darphin. Firstly I’ve been using the Azahar Floral Water Micellar Cleanser which is a gentle formula and removes all the day’s makeup with very little effort. The natural orange blossom scent is instantly soothing making the whole cleansing experience a pleasure rather than a chore. In the mornings, i’ll then reach for the Vitalskin Anti-Fatigue Dynamizing Serum which injects my skin with freshness and gives an 8-hour sleep effect even if I’ve had a poor night’s sleep. I’ve tried products with these promises before but the Darphin serum is the first one that I’ve tried that gives noticeable results from the very first application. When used with the Uplifting Eye Serum which has a gentle tingling sensation on application, my skin looks and feels calmer and brighter. Before applying my makeup, i’ll smooth some Vitalskin Replumping Energic Cream over my face – the formula is enriched with botanical concentrates which support skins natural energy. It perfectly complements the Dynamizing Serum and Uplifting Eye Serum to give your complexion a triple boost. The results after application are noticeable straight away – my skin has a soft glow which is usually reserved for when I’ve come back from a sunny holiday! The area around my eyes in particular looks refreshed and my entire face feels smoother and plumped. As for my blemishes, they have quickly been reduced to just red marks, and hopefully the healing ingredients will continue to work their magic over the next few days to reduce the redness. The real pampering happens in the evening. After removing makeup and applying the serum with the above mentioned products, I then reach for the Revitalizing Oil which is the ultimate multi-tasking luxurious product. A blend of plant and essential oils, it can be used on the face, body and hair. While I’m yet to try it out on the latter two, I have been treating myself to a few moments of calm before getting into bed by rubbing the oil between my hands, and inhaling deeply for a few minutes before patting it onto my skin. As I’ve been sleeping badly recently, I’ve been noticing the difference that the oil has, the soothing aroma instantly relaxes me and I’ve had a far better evening’s sleep since using the oil. After I’ve given it a few moments to sink in, I dot on some of the Ideal Resource Overnight Cream. As your skin is in recovery mode at night time it’s important to support it – and this radiance boosting cream encourages cell renewal and also works to restore a fresh looking complexion. As with the rest of the range, the aroma is delicious and instantly gives a sense of well-being. The Neroli Essential Oil gives the cream calming benefits which works well with the rest of the range to create well rounded rejuvenating and soothing results. So with just a couple of days of sticking to Darphin for my skincare, and I’m already noticing the benefits. Whether it’s the soothing aroma which gives a relaxing and refreshing experience, or the botanical ingredients which deliver noticeable results – I’m already falling in love with the Darphin products. As it’s less than a week since I started using them, i’ll be posting more thorough reviews for my favourite products in the upcoming weeks. Darphin and Look Fantastic are hosting a Google Hangout on Friday 31st October at 12pm – so join me and the team, as well as a group of other beauty bloggers to discuss your skincare questions. You can view the chat via this link – and enter any of your skincare questions on twitter using the hashtag #AskDarphin! You can shop the Darphin range on LookFantastic.com here!